Cancu n private transportation direct from the CUN International Airport to Isla Mujeres Ferry dock. NEW! Ultramar ferry tickets are now available for purchase with your transfer. Your driver will have them when you arrive. The Ultramar ferry departs every 30 minutes from 5:00 AM until 12:00 AM. Book online and pay securely with your choice of PayPal or credit card. We’ll send you the confirmation email vouchers to print and bring with you to Cancun. The vouchers have all the details you need. Flexible Payment Options: Choose to either pay cash to the driver or prepay securely online. We’ll send you the confirmation email to print and bring with you to Cancun. The email vouchers have all the details you need. 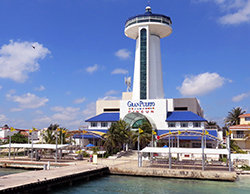 Isla Mujeres ferry from Cancun Airport: For transfers to Isla Mujeres, we will take you to GRAN PUERTO FERRY DOCK, also called Gran Puerto Cancun. This is the main fast ferry Ultramar, the big blue and yellow boats to Isla Mujeres. NEW! Ultramar ferry tickets are now available for purchase with your transfer. CARM Transfers also provides transportation to Blue Bay Club and Hacienda Punta Sam, in addition to Isla Mujeres ferry terminal Gran Puerto Juarez. The ferry to Isla Mujeres costs 146 pesos per person round trip (or 78 pesos one way) and it takes about 20 minutes to get from Puerto Juarez to Isla Mujeres. The first scheduled boat leaving Puerto Juarez in the morning is 5:00 AM and the last one at night leaves the dock at 11:30 PM. Leaving Isla Mujeres, the first ferry is at 5:30 AM and the last one at 12:00 AM. The ferry departs every 30 minutes until 8:30 PM, then goes every hour. If you have an early departure flight time (8 AM or earlier), you may want to leave Isla Mujeres the night before and stay your last night in Cancun or close to the airport. The earliest we can pick you up at the Gran Puerto ferry dock is 5:50 AM, which gets you to the Cancun Airport by 6:30 AM. Flexible payment options***pay by cash (US Dollars or pesos), credit card, or PayPal. You can add on COLD WATER for only $1 each and we’ll have it in the vehicle for you. How do we find our driver? We have staff at the airport to greet you. They hold a sign with your name and our logo on it. Our staff is waiting OUTSIDE for you. If you have any problems locating your greeter, just call us at 407-284-1673 or local in Cancun 273-2970.
Who do I pay, how and when? At time of booking you can choose either credit card or PayPal to pay in full for your transportation. Price is total, not per person, and it includes flight tracking & airport greeting, parking, taxes & insurance. It does not include tip to the driver.What if we can not find our driver or greeter?Our staff is always there, but they may be helping others. Just look for your name on the sign and our logo.Flight delays / cancellations / changes: Call or email us. We need to know about any changes to your flight. You will have more updated info than we do here in CancunDo you have child seats? Yes, you can request a baby car seat for your child, no charge. They are rated for up to 40 lbs. front-facing or 30 lbs rear-facing.Can you do other services such as taking us to a restaurant or to Wal-mart before going to our hotel? Of course! Just email us your request and we will give you a quote. Wal-mart trip is an extra $30 for 1 hour, which is usually sufficient time. This needs to be booked ahead of time. Can you have drinks waiting for us in the vehicle? Yes, we offer cold bottled water for $1 each. You can add this onto your transfer order in the shopping cart. Do you take people to other cities or just Cancun? We take you almost anywhere! Please click on the other destinations above. Email us for a price if you don’t see your town. What is the usual tip? I like to tip the driver about like I do a waiter…make it a percentage of the total based on service. Tipping is a personal thing, you can tip as little or much as you want. This is just my suggestion. Basically for Cancun hotels $5 to $10 is a good tip. IF you are traveling further into the Rivera Maya you might want to tip a little more. The drivers know they must earn any tips.